This agriturismo is located near Siena in the countryside in the hills. In total there are 5 apartments. From the agritourism you have views of Montepulciano and the Valdichiana. The rustic house was once an inn for pilgrims on their way to Rome. Appartamento Logetta is located on the first floor with private terrace. In the well-tended garden is also another terrace for guests. The apartment has terracotta tiles and wooden beams on the ceiling and the interior is cozy and rustic. 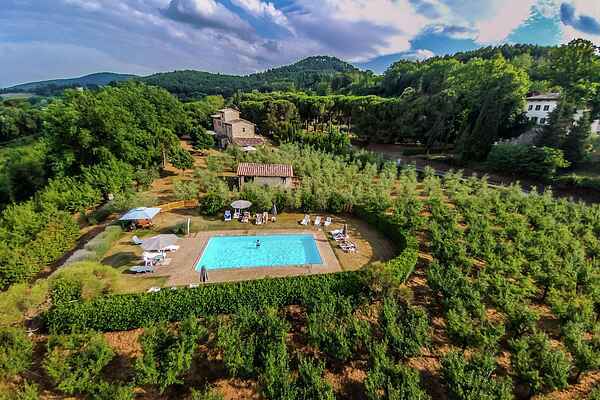 There is a pool with a beautiful view over the hills of Montepulciano where you can relax. The environment consists of olive groves, vineyards, fruit trees and Tuscan hills. The farmhouse has a strategic location for Siena, Perugia and Orvieto to visit. The natural hot springs of Chianciano Terme and Bagno Vignoni are nearby. There are opportunities for hiking or mountain biking in the area. The agriturismo is engaged in organic cultivation of fruit trees. In the production of jam antique methods are used without sugar and chemical additives. Take delicious homemade organic jams, for example quince with pigeons or orange. Delicious jams and wonderful labels. Also nice to get back home after the holidays.